Six Organs of Admittance, the experimental folk/rock project of Ben Chasny and various collaborators, returns to Charlottesville this evening! He’ll be playing at The Southern with two opening bands — more about them in a second. Six Organs’ material is kind of all over the place; some of it is extremely austere instrumental folk, while some of it veers pretty far into psychedelic rock and drone territory (my favorites at the moment are 2000’s the Manifestation and 2006’s the Sun Awakens, although School of the Flower, his 2005 collaboration with Chris Corsano, is a classic). It’s all pretty great, though — definitely a thing worth checking out. He last appeared in town was back in 2008 at the UVa Chapel, and it was a fine show; in the first half he performed solo, and it was super-sparse, bleak, and minimal — in the second half, he brought Elisa from Magik Markers onstage, and they got cathertically noisy and loud. It was a great show, and I’m excited to hear him play again. The other exciting news is that the fantastic local group Mss. is going to be playing tonight, and not just the regular duo of Tyler and Josh (although that’s exciting enough on its own); tonight’s line-up is going to have no fewer than six members (fittingly), with the brilliant Cathy Monnes, former Hilarious Posters Dave Gibson and Renee Reighart, and local troublemaker Dylan Mulshine all joining in. So, that would make a show worth attending all on its own, I’d think. The other opener is Donovan Quinn; I don’t know anything about him, although folk on Twitter have compared him to Bob Dylan, although I’m not sure if that’s a joke re: Donovan Leitch or not. The doors at the Southern open at 8pm, and the cover charge is $10. I may be mistaken, but I believe it’s a seated show. 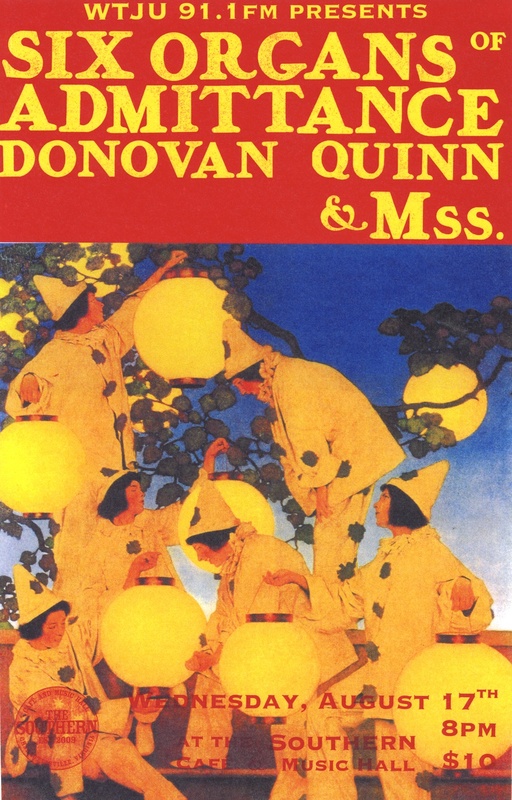 oh yeah, many thanks to Ryan from Random Row books for loaning me that expensive Maxfield Parrish hardcover I couldn’t afford so that I could use it to make the poster; the six lanterns / Six Organs correlation was too promising to pass up! There will actually be seven people playing in Mss. tonight. Bryan Hoffa will be there shredding his incredibly awesome Mosrite guitar as well. It will be worth coming out just to see his guitar because it is truly a thing of beauty and he makes beautiful noise with it. standing show tonight, though we always have some tables and chairs in the room and plenty of ledges to sit on. and we’ve had shows where people sit on the floor, so there’s that as well. should be really nice – ben and donovan both sounded great at soundcheck and mss. is almost certainly going to be awesome. whoa, soundchecked mss. and it was definitely awesome! well, that was a pretty dang badass show last night – donovan was quite good and ben/six organs was awesome (the guy can play the heck out of the guitar), but i gotta’ say, mss. was truly off the hook. i’m old and i’ve seen a lot of shows and mss.’ set really blew me away. and yes, that’s a cover of gordon lightfoot’s classic song, sundown. Thanks Andy! Can’t say enough how good this show was. The trio of “Oppress Yourself” (Lungfish cover absolutely nailed!) into Gospel into “Sundown” was truly great. Even Ben (6 Organs himself) made a point of saying how good the Mss. set was. Of course Chasny killed it, his set just got better and better and better until at the end he was practically superhuman. I second that, Andy. Wow, Mss. was goddamn amazing! They stole the show for me, personally. Can’t wait to get that recording! well this sure is my favorite blogsite probably always and certainly right now. Thanks Andy for hosting, & posting that mp3 (actually couldn’t hear the vio in the monitor when I was paying so it was an act of faith & hope of not sucking so hard I hurt something. but the sundown happened replete with all it’s strange beauty thanks to the Msstery of it all. James thanks for the kind words upfront & beyond, And beautiful job with the poster. downright goddamn amazing altogether, yup, trumpet and shredding mosrite & whatnot, not to mention a house full of everybody I was so glad to see.